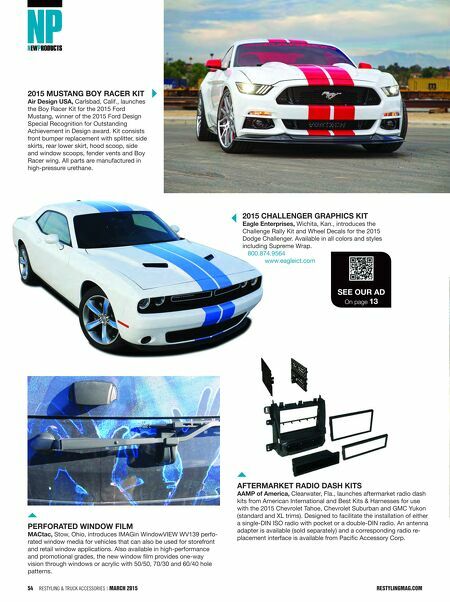 54 Restyling & tRuck AccessoRies | March 2015 restylingmag.com See Our Ad On page 13 2015 MuStAng BOy rAcer Kit Air design uSA, Carlsbad, Calif., launches the Boy Racer Kit for the 2015 Ford Mustang, winner of the 2015 Ford Design Special Recognition for Outstanding Achievement in Design award. Kit consists front bumper replacement with splitter, side skirts, rear lower skirt, hood scoop, side and window scoops, fender vents and Boy Racer wing. All parts are manufactured in high-pressure urethane. 2015 chAllenger grAphicS Kit eagle enterprises, Wichita, Kan., introduces the Challenge Rally Kit and Wheel Decals for the 2015 Dodge Challenger. Available in all colors and styles including Supreme Wrap. 800.874.9564 www.eagleict.com perFOrAted WindOW FilM MActac, Stow, Ohio, introduces IMAGin WindowVIEW WV139 perfo- rated window media for vehicles that can also be used for storefront and retail window applications. Also available in high-performance and promotional grades, the new window film provides one-way vision through windows or acrylic with 50/50, 70/30 and 60/40 hole patterns. 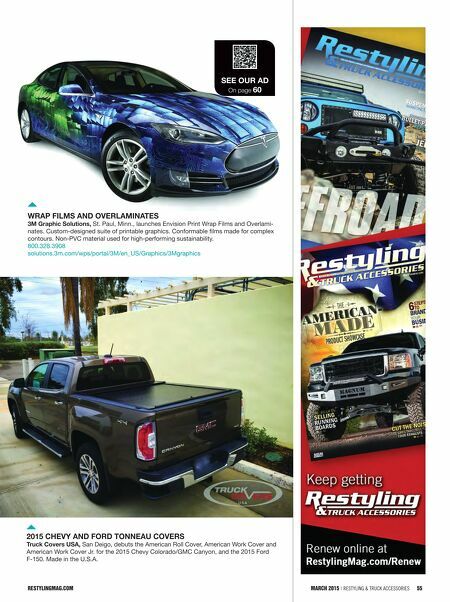 AFterMArKet rAdiO dASh KitS AAMp of America, Clearwater, Fla., launches aftermarket radio dash kits from American International and Best Kits & Harnesses for use with the 2015 Chevrolet Tahoe, Chevrolet Suburban and GMC Yukon (standard and XL trims). Designed to facilitate the installation of either a single-DIN ISO radio with pocket or a double-DIN radio. An antenna adapter is available (sold separately) and a corresponding radio re- placement interface is available from Pacific Accessory Corp.